Right-click the hyperlink and select Open Hyperlink on the shortcut menu. Test your hyperlinks in Slide Show before your present to others to ensure that they work as expected. 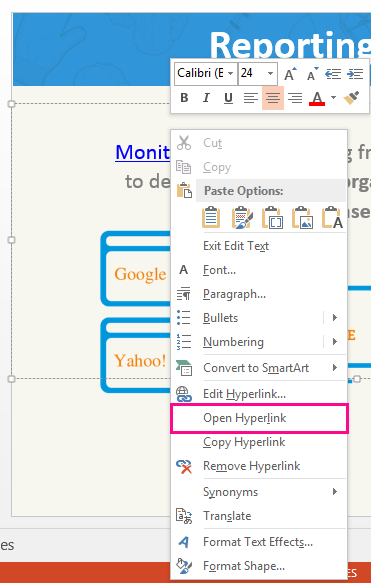 In PowerPoint for Office 365 and PowerPoint 2019, in Normal view, you can also open a hyperlink by pressing the Ctrl key and clicking the hyperlink. You can open a hyperlink during a slide show by clicking the link. Click Slide Show > From Beginning to start your slide show presentation. When you see a hyperlink in the presentation, click the underlined text to open, or follow, the hyperlink. The slide show remains active when the link opens. You might need to close the linked webpage or file to return to your presentation. See Add a hyperlink to a slide.